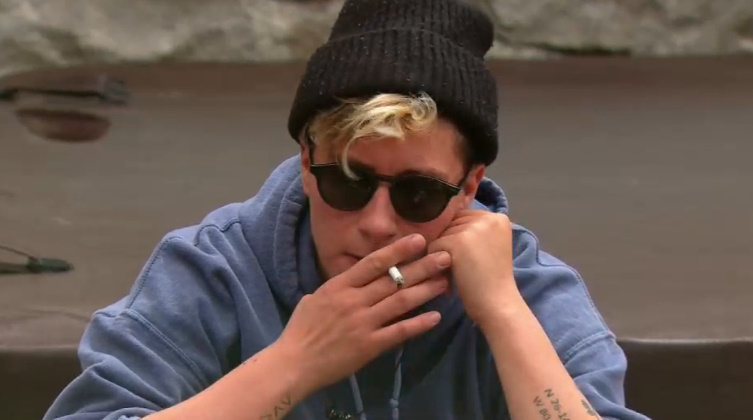 Big Brother Canada Spoilers – Dane used the Power of Veto on himself. Cory nominated Sam in her place. Sam is the target this week. No real surprise. Dane is saying that Kyra and Sam are scrambling ..
Cory asks him what was his conversation with Adam. Dane – I said.. right now you are not a target. If you keep huffing and puffing about this you better win next week because you’ll be a target. Dane – he’s like OK .. you and ‘me’ don’t need to talk right now. Sam still hates me. Cory says Sam is going around saying she’s had one on one conversations with her during the HOH. Dane says Liars attract Liars, Kyra, Chelsea, and Sam have all stuck together. Dane – they all lie. Dane – I was saying Adam why are you focusing all your negative attention on me. I can take it I’m off the block. 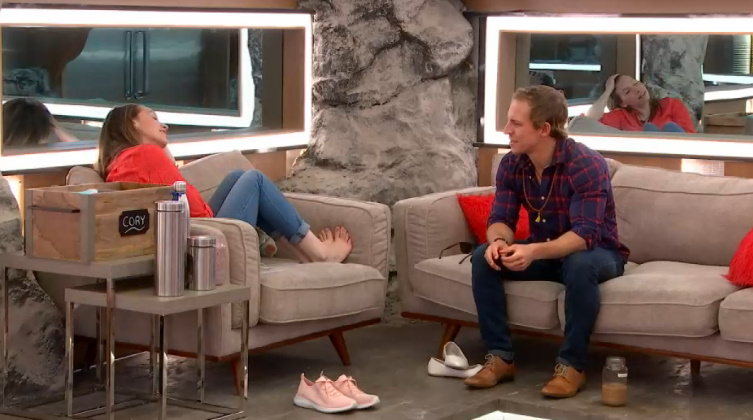 Dane – this backdoor will be the greatest executed plan in Big Brother Canada History and I’m so happy to be part of it. Cory 0 the reason why it’s gone so well is it’s stayed between the three of us the entire time. we didn’t share .. it stayed loyal between us. We’re Running it. Dane – after this week it’s perfect it’s all good.. and they say you made a bad move. you are on nobodies radar. Cory says if Anthony can pull out a win this week. Cory again mentions that Kyra’s and Sam’s story about the backdoor plan last week does not add up that is why Sam is on the block. Cory – it’s not because they are liars there’s whole all over the place. Dane says he’s been a hockey Captain for 5 years he can stand in front of his team and take the heat. Dane – she knows she doesn’t have me and she doesn’t have Damien. Dane says he’s going to tell Adam how much Sam is lying to Cory trying to get her to target him. Dane – As a fan of the show if I was watching this best week yet. Adam – he said in the bathroom… If I stay (on the block) I have your vote right. We both said we have him. Adam – we had your f*ing back when you are up there. I would have been the deciding vote we those boys. Adam – he’ll probably just say oh if you can convince Cory. Sam – I think I can get Mark. Adam – I know everyone thinks Adam will go up next week. Adam and Kyra. Mark is worried Adam is going to go guns blazing after SAm goes. Anthony says Adam is going to cry when Sam leaves and then he’ll be done. Anthony – we got her to jury you (adam) got your vote.. that’s what you’re crying for the whole time bringing Sam along after she put Mark on the block and almost put Dane and told everybody she was going to put me on the block. Anthony tells him that Sam originally wanted Mark to go home. Anthony – that’s the first name she said when we got into the room..
Anthony – this is what I do this is why I’m here.. do you think I am going allow people to breath air about getting mark out of here. You’re out of your frigging mind..
Anthony – I heard about the backdoor plan right after the POV. between me and you I know it was Dane and Adam.. and I know Sam was there to. In a season where the rumours of a guys alliance are brought up hourly, Cory still finds a way to nominate the only eligible girls in the house. hey simon, has anyone ever actually sat down with cory to talk about the guy’s alliance rumours? i remember chelsea sam and kyra. chelsea este (disaster). sam kyra kiki and este last thurs/fri. don’t remember if cory was there. I can’t wait for these girls to get out of the house and see how stupid they were and how these guys played them all. Yeah why not. The “girls” are being massively outplayed this year, so get production involved (which they already tried with the blood veto) to ruin the rest of the season. I believe Mark thinks he’s playing a Kevin Martin preseason playbook bbcan3 game. he’s not getting the edit or the screen time. he lacks the ability to share any game information whatsoever in his under the radar playing all sides game. he’s woefully lacking in any charisma. his attempts at endearing read as creepy. I’m sure he thinks he’s playing well, and diabolically fulfilling his mission statement. His failure in communication skills is only going to read as sketchier and sketchier as the herd thins. I’m sure he can make top 6, but in top 2 his only chance of winning is if he isn’t the hoh that evicts a prettyboy (they WILL be bitter in jury), and he HAS to take someone that has been less of a factor in the game than him. At this point it’s possible even Kyra could beat him. Este? No chance Este beats him. Kyra may be universally acknowledged as the goat, but Este gets even less respect than Kyra from everyone left in the game. Kyra is the toxic goat, Este IS the goat. A couple of insights from today’s Sam re-nom which I found interesting. First, Mark is carrying a grudge voiced toward Sam (but clearly also directed at Adam) for his going on the block instead of Damian or a non-PB member. But, the main one was Anthony has reached a whole new level of HOH-itis while not actually being the HOH. Some of his actions today would warrant him rising up the list as the main target in the house but this season has been anything but normal. *As per above Anthony told Mark/Adam he’s been running the house since the beginning. The fact he’s now rubbing it in his own alliance faces how he’s running the house is an extremely dangerous choice to make. out at F4 (right?) It makes zero sense for Dane to want to take two non-PB members to F4 or to have taken out Kiki just to stay loyal to the PBs only to shift now to take Cory/Kyra (someone he despises) to the end. Right? * Anthony seems to be somewhat “REIGNING” by fear – like “if you have the audacity to even suggest nominating myself or Cory you’ll pay for it when I take you out the next week”. We’ve seen this type of behavior in the past where someone rules with threats but Anthony really does seem to be playing up his physical size/power/popularity & position in the house to the next degree. It’s almost like he’s challenging anyone to call him out on it. 1. Do we think Mark/Adam/Dane are just going to roll along with Anthony DICTATING who is nominated, evicted & targeted? 3. Even if Adam were to tell the truth & then confirm it with Cory would she believe it? 4. Is there ANYONE in the PBs with enough bravery to call out Anthony for being the ONLY ONE who is never in jeopardy of hitting the block and WORSE is the only one allowed to have side allies. If we’re honest Cory is actually the most dangerous non-PB member left once Sam leaves so why is she immune? If Anthony’s rationale for taking out Damian & keeping Kyra b/c she’s easy to beat resonates then shouldn’t that also apply to why Cory has to go? 5. If you had to guess – do you think Anthony is serious about winning HOH this coming week? (I don’t think he is) and if not who would you place your bets on winning? 6. If Adam wins HOH – would it be the END of the PBs? Because Adams plan is to nominate Dane/Este & then backdoor Cory. 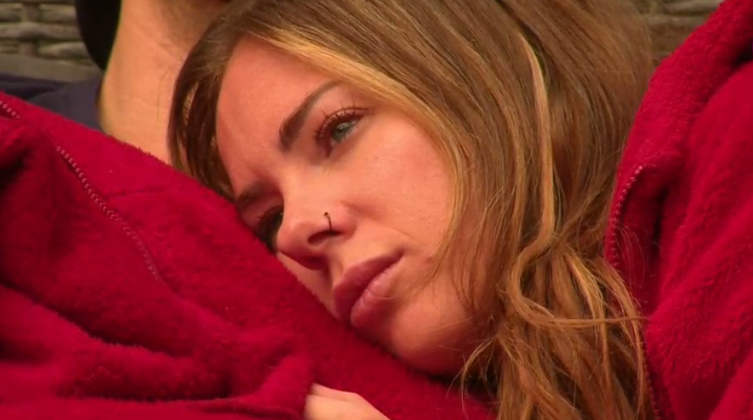 The problem is as long as Adam keeps Kyra in the loop she’ll continue to play the dutiful rat to Anthony. 7. Can Kyra/Sam get past their own egos to stop long enough to recognize their actions are fueled by Dane hate & they are ignoring who is really controlling the house (Anthony). 8 What is the over/under on Dane really being 100% in on this F3 of Anthony/Cory & himself? I can answer #7. The answer is an easy no. Kyra is a nasty piece of work. No wonder she is seemingly so confused with her identity and actually very unhappy in general. Sam has used her looks in life to get what she wantd. However, she picked the wrong guy, Dane would have been smarter choice but she roped in Adam as he was a physically strong player; but ended up being an emotional midget. Sam needs to remember who was in the room when she decided on her nominations last week and have a talk with Mark and Damien. Eventually with Cory, let Damien and Mark chew on it for a while, see if Mark cracks. – Last week, Adam and Dane made an agreement not to put up each other or Sam and Esti. – Dane eventually suggests Mark (knowing they can POV Mark off/vote to save him). – Sam wanted to BD plan in place. – The PB’s know Anthony likes to stir things up, Adam and Mark plant seeds that Anthony convinced enough to vote Sam out, then flipped his vote for house drama/no one would consider him the culprit. Still no blood on his hands.